Today’s first choice for The 2018 PopCult Gift Guide is a perfect gift for any fan of classic 1980s comedy shows, SCTV and Saturday Night Live. It’s the obscure but acclaimed live action/animated series, The Completely Mental Misadventures of Ed Grimley, and you can get the entire series of 13 episodes from Warner Archives. 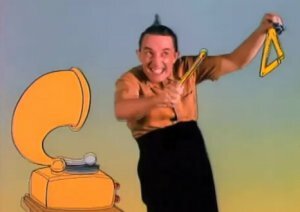 The Completely Mental Misadventures of Ed Grimley was a 1988 animated series produced by Hanna-Barbera starring Martin Short’s Ed Grimley as well as other characters and actors from Second City’s SCTV. Martin Short’s immortal creation Ed Grimley, the nicest nerd to ever slick up a top knot, began life during Short’s Second City days and followed him onto Saturday Night Live. As Short’s comedy career took off, so too did the fame of his creation, and Ed eventually “graduated” from late night to early morning. Short provides the voice for Ed, and is joined by a coterie of comedy compatriots including fellow SCTV alums Joe Flaherty, Catherine O’Hara, Andrea Martin, venerated voice vet Frank Welker, and the titanically talented Jonathan Winters. Ed lives with his goldfish – Moby – and a clever rat named Sheldon while sharing screen time with a mix of or original characters and SCTV favorites. Episodes feature Ed Grimley’s bizarre adventures interspersed with science lessons from The Amazing Gustav Brothers, Roger and Emil, and a live-action segment with a “scary story” presented as a show-within-a-show by Grimley’s favorite television host, SCTV’s Count Floyd (played by SCTV cast member Joe Flaherty). This was a high-water mark for the latter days of Hanna-Barbera, and one of the last great Saturday Morning kids shows before the networks abandoned the idea of programming for kids following the advent of cable. This 2-Disc Collection presents all 13 of Ed’s amazing animated antic adventures – Totally Decent! Tuna casserole awaits! Order it from Warner Archives. It’s only thirty bucks, a mere pittance, I must say.